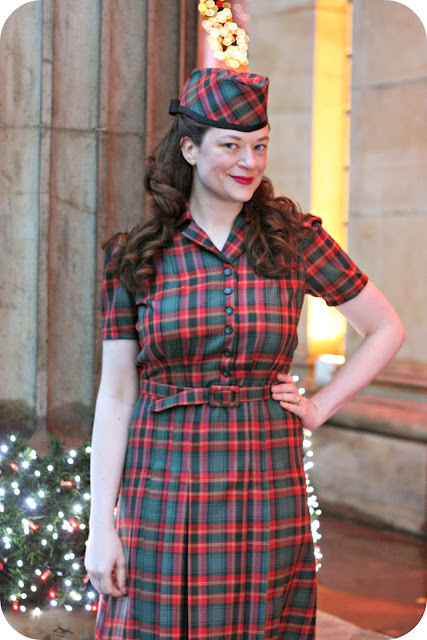 This is truly the perfect 1940 Christmas outfit--and I'm so happy with the way it came together! 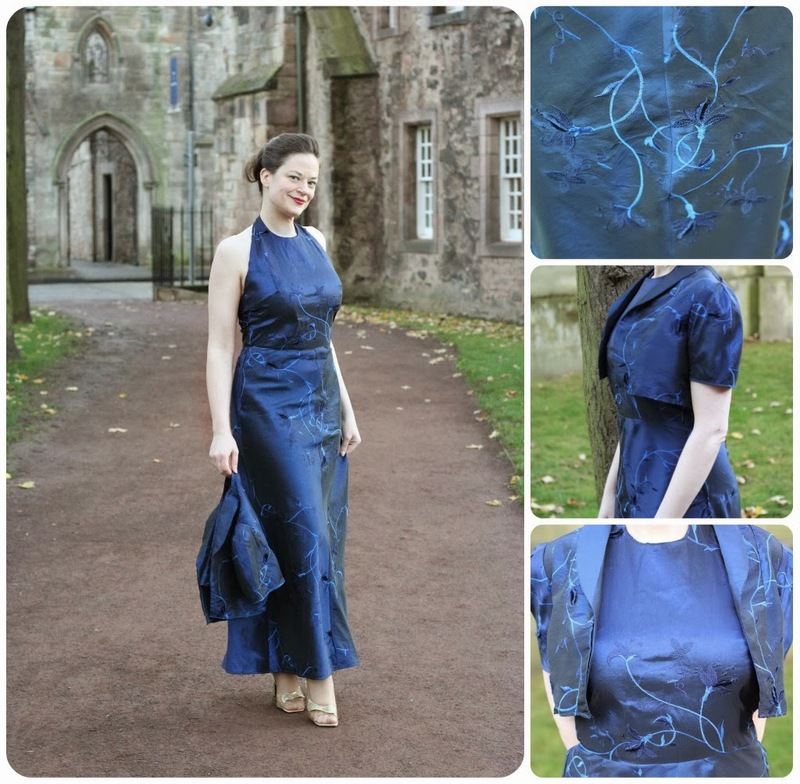 The dress is made out of the most beautiful lightweight wool fabric I got from the Cloth Shop, a local Edinburgh fabric store. It's a wonderful weight to work with and it feels so soft. 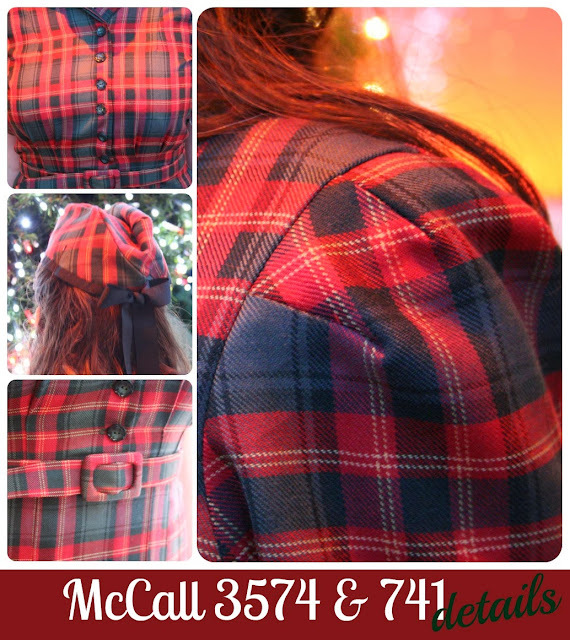 McCall 3574 is your basic 1940 softly tailored shirtwaist dress. It features a button down bodice attached with a lapped seam to a pleated skirt. The pleats in the skirt also match up with three pleats in each side of the bodice front. The back of the dress has two darts near the neckline. 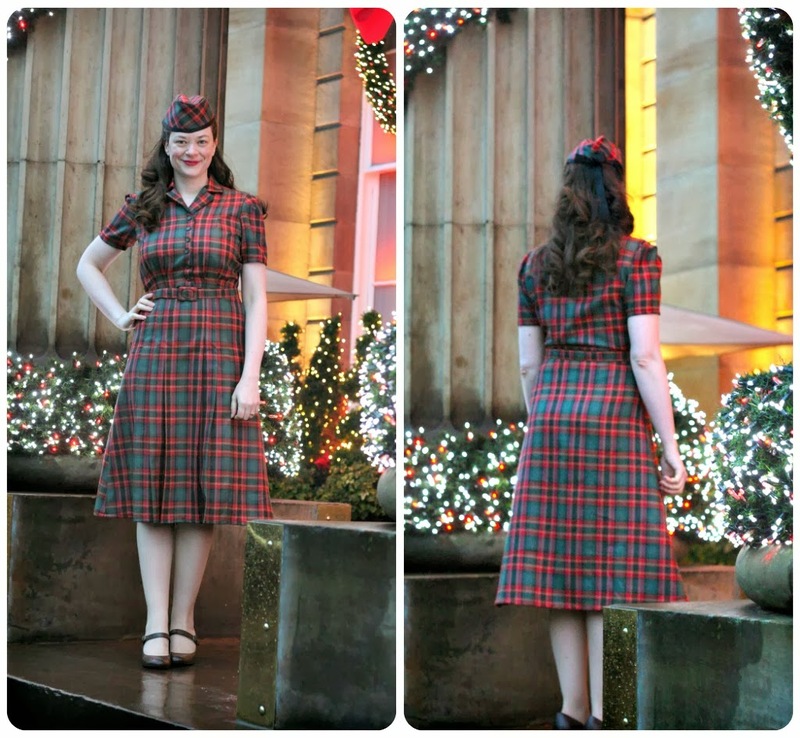 Other than that, the back is very plain and features a straight skirt which allows the tartan pattern to be mostly uninterrupted. Matching the plaid pattern took a lot of forethought and planning during both the cutting and construction phases. 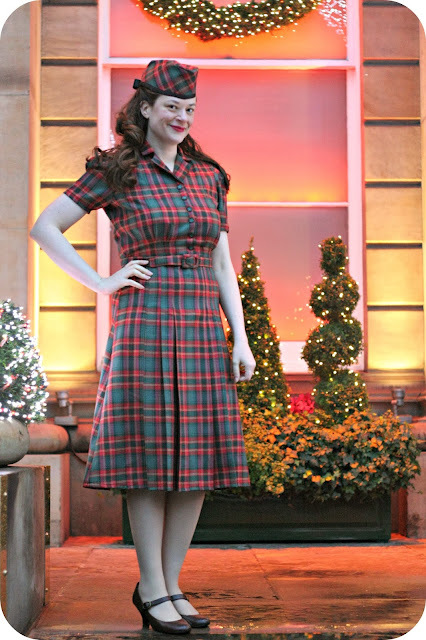 I'm really happy with my plaid matching throughout the dress including at the bodice front placket, where the bodice and skirts match up and even at the hem! 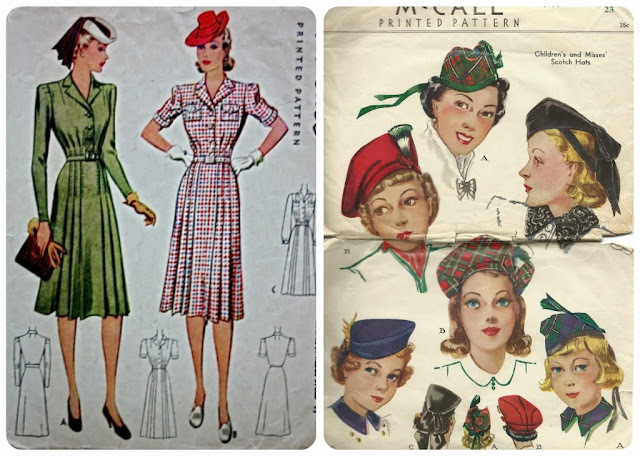 The sleeves are my favourite kind--pleated at the sleeve cap! David even made me the matching belt buckle and belt. We made a soft belt with hair canvas as the main material. The belt buckle is from a 1950s/60s buckle kit that I got from my most recent pattern swap partner. I also had some perfect vintage buttons in my stash in the matching green. I am over the moon about the Glengarry hat. 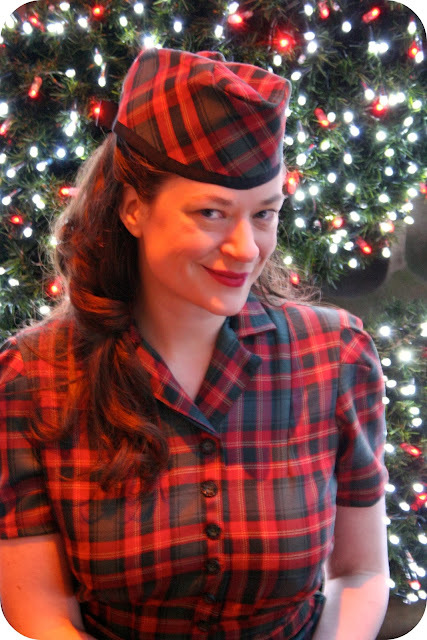 This Scottish style of hat was very popular in 1940! Plus, no one here blinks an eye when they see it--they are still very commonly worn in Scotland, especially on festive occasions. I just love it!! The hat pattern comes in one very oddly shaped piece that you configure together. David sewed the entire hat by hand!! I am super impressed and it fits me perfectly. It is attached onto hair canvas as well which gives it enough body to hold the shape but makes it soft and very comfortable to wear all day long. I secure it with two bobby pins/kirby grips at the back. The hat is trimmed with grosgrain ribbon and fastened into a bow in the back. The pattern also comes with instructions on how to make other hat trimming such as a cockade. It's a great pattern and I plan to make many more hats from it. I'm already envisioning a new hat for each of my 1940 makes! YAY! A happy Scottish tartan dress. I know I will get lots of wear out of this one. 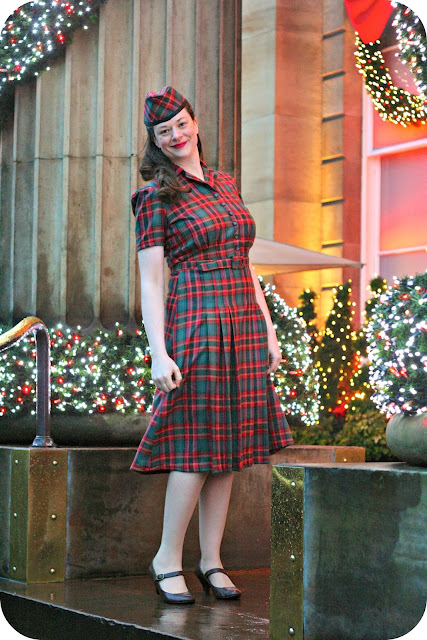 Hope you all have a lovely New Year's Eve and I'm looking forward to sharing our sewing adventures in 2014! I'm taking a short blogging break over the next two weeks for the holidays! I hope everyone has a lovely holiday season and I will be back later this month with more vintage sewing projects and goodies! 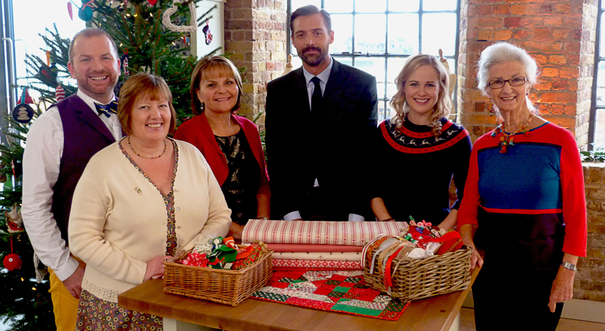 You've probably heard that the Great British Sewing Bee is running a Christmas Special? More details and some clips are on the BBC Website. I can't wait! Makes me crave a new season even more. Does anyone know when season 2 will air? I'm assuming spring?? 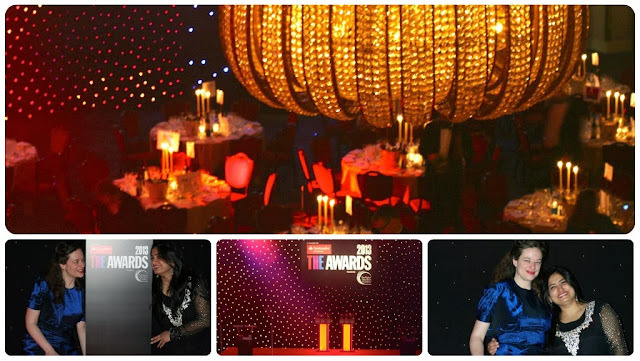 On Thursday evening, I had the chance to attend the Times Higher Education (THE) Awards Ceremony in London. 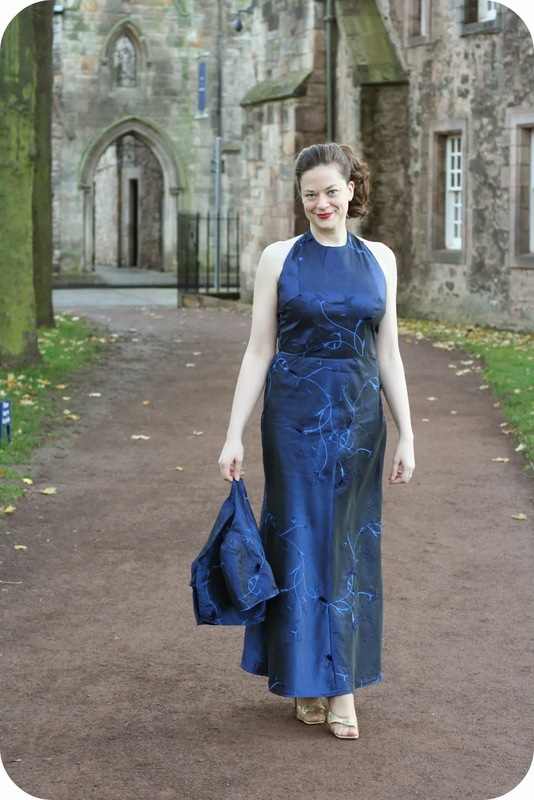 It was a swanky, black-tie event and I just barely managed to finish this gown in time! 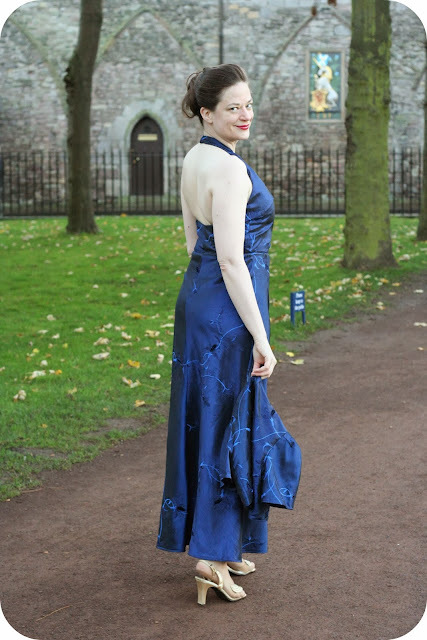 You may remember, when I first heard that I would be going to the awards ceremony, I held a poll on my blog for which gown I should make. I had wanted to make a gown from one of my 1940 McCall patterns. I ended up getting busy at work and waited too long to begin sewing the gown. 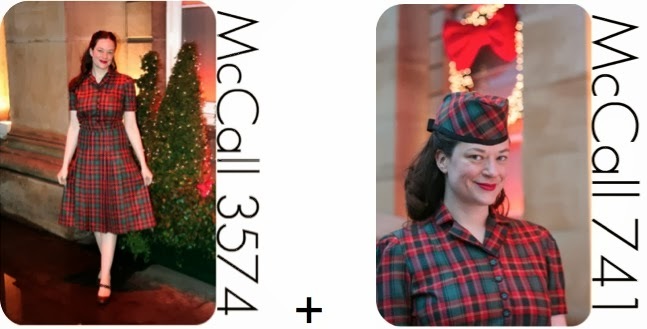 When I pulled out the 1940 McCall gown pattern, I realised it would take an astonishing 6 metres of fabric! Eeps! I knew it would be too much to spend for a gown, since most of the nice dress fabrics are quite expensive here. Then I remembered about this beautiful blue taffeta fabric I had in my stash that I had bought a couple of years ago from Croft Mill. I had nearly 4 metres in total and knew it would be perfect for the event. The question was, which pattern should I sew to go with it? 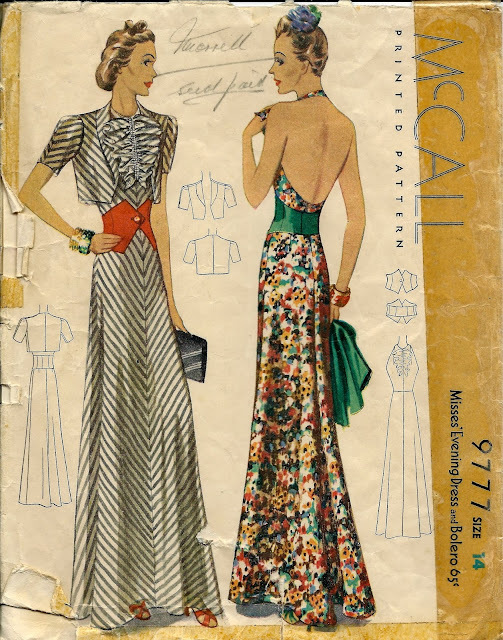 At first it's easy to get lost in this gown pattern because there is a lot going on--ruffled dickey, fabulous belt, busy printed fabric…but if you look at the line drawings, you see a very chic halter dress gown. And I knew it was a match made in heaven! I made several changes to the original pattern: The original pattern has a seam down the front which is partially covered by the ruffled dickey. I decided that I would go sans dickey and instead sew the bodice front on the fold and eliminate the centre front seam altogether. I also didn't opt to make the belt. I tried my best to make the intricate embroidered flower detail of the fabric match up while cutting out the material. This was made all the more difficult in that both the skirt pieces are cut on the bias. I was able to match up part of the design down the centre front and centre back but less so on the side seams. Because of the bias cut, it gives an unexpected shape to the embroidery-which I really like! 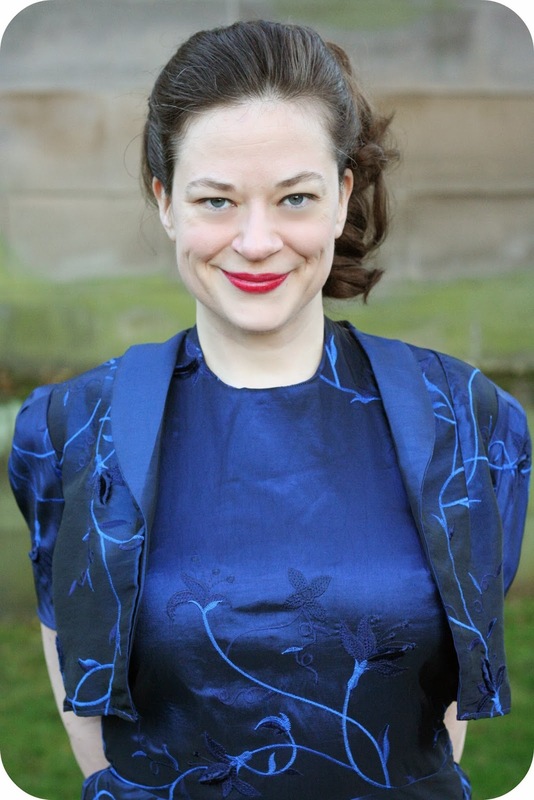 I made the matching short collarless bolero, which cleverly catches the front facing in the shoulder seam..giving the illusion of a collar! The back of this dress is amazing! I just love the low-cut scooped out back and how the little bolero completely covers it up. To give a bit of stability, I interfaced and lined the entire bodice. The dress closes with a side hand-picked zipper and the halter has two hook and eye closures. I ended up being able to just barely get enough fabric for the full-length gown and matching bolero. 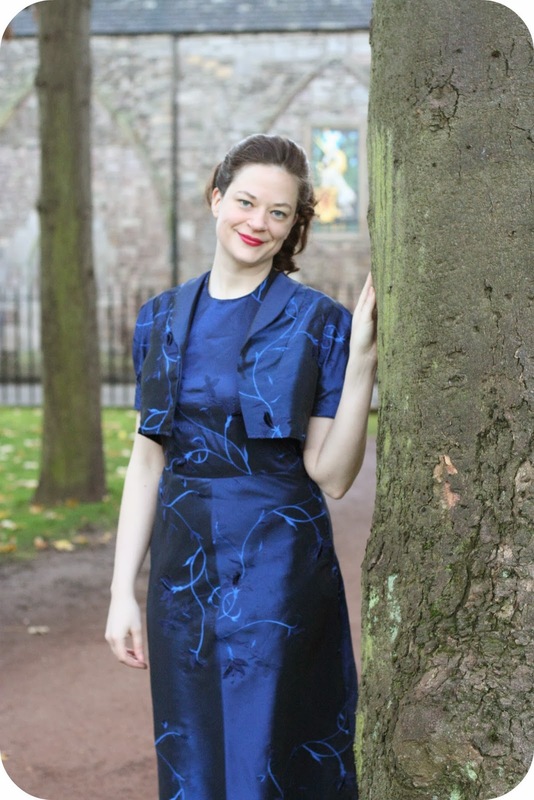 Oh, did I mention that I ended up sewing up this entire dress (bolero and all) the day before going down to London? Yup, things have been a bit crazy busy around here lately…I can't believe I got it done in time. A big thank you to David for helping me hem the dress and for sewing the hook and eye closure at some absurd hour in the morning!! And the awards ceremony was AMAZING! There was a reception, followed by a grand dinner, the awards ceremony and the event ended with dancing. phew! Javita and I had a great time with the other women who attended the ceremony with us. Unfortunately, our University didn't win in the category for which we were nominated…but the University did win in another category! Which was fantastic. She even came and sat at our table before starting--I was star struck! 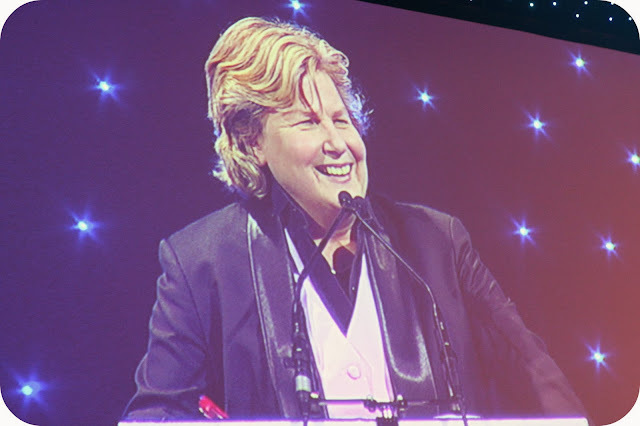 It was such a fabulous evening. Hopefully I can revisit my 1940 gown patterns for a holiday or New Year's Eve dress! 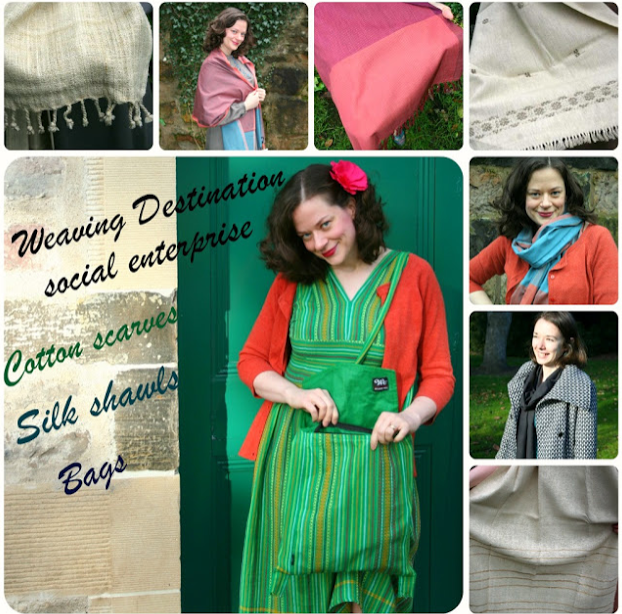 Wow, can't believe it is the very first Small Business Saturday and Cyber Monday for Weaving Destination! We are super thankful for all of you and to show our appreciation, we are offering a 20% discount code to our Etsy Store from now until Thursday the 4th of December! !